This Page is dedicated to MALA Lipizzan Stallions. Melanie Adam's Pluto Matina "Frodo"
Has consistantly placed in the ribbons at the USDF/USEF breed shows. His scores have ranged from 62% to 76%. From Fair Hill , Dressage at Devon and PVDA breed shows. He was born in April 2004. This winter i started ground driving him. Frodo has a great and very willing temperment he is of more sport horse in type. His disposition, character, ability and softness are truly what dreams are made of! This is all mixed with his great confirmation. For more information you can check out his pedigree below. 6-28-07 Frodo's first foal is born and georgous! Fair Hill USDF show 8-18-07 Pluto Matina placed 2nd in the open sport horse class with a score of 68.6 and first in the Lipizzan class with a score of 70.4 He will be at Devon in a few weeks. If you are interested in breeding there is a $200 booking fee. 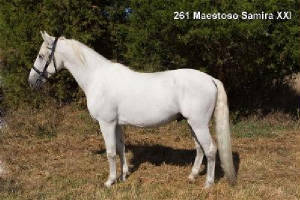 Breeding fee's are $1000.00 to purebreed Lipizzan and $750.00 to non Lipizzans. Breeding contract required. If you reserve and pay booking fees at least 3 months prior ask about early bird discount. Maestoso Samira XXI, foaled in Slovenia in 2000 and imported in 2005, is a grandson of the 1984 Olympic dressage competitor Maestoso Monteaura, who also won the Grand Prix Special in Rome, 1983. Maestoso Samira XXI is sired by an Elite Stallion at the Lipica Stud, Maestoso Bonadea XIV. His dam Samira XXI is an Elite Mare, Champion of the Slovenian Lipizzaner Breeders Association and Third Place Winner at the International Lipizzaner Show in Topolcianky, 1997. In addition to Maestoso Samira XXI’s superior bloodlines, he has a wonderful temperament and exhibits extraordinary rideability. This stallion is a true partner, working with the rider and trying to please. At his breeding evaluation in Slovenia, Maestoso Samira XXI received a score of “9” for overall richness and efficiency of movement. The regularity and rhythm of his gaits should enhance your mare’s and help produce a superior dressage prospect! Mihko has 8.5" cannon bone and can add substance to your mare. Lipizzaners have been bred for dressage for 425 years! Although noted for dressage ability, Lipizzaners have shown talent for other sport horse disciplines including driving, jumping, Pony Club, endurance trail, and even working cattle. This is your opportunity to own a rare, historical treasure once reserved for royalty. Part-bred Lipizzaners may be registered and are eligible for awards. "Mihko" has his first offspring on the ground! Tempel Farms Lipizzans announced that Almira had a filly by Mihko in 3/22/07. They describe her as sweet and spunky. We first saw him many years ago at a horse show in Wellington, FL with his then-owner Janet Quinn and trainer George Williams in the irons. He dazzled us then so much we vowed that one day we would breed to him... We never dreamed he would come to be ours! Delta has been bred to both purebred Lipizzaner mares and fine Dutch mares with the same results: SPECTACULAR FOALS! At his approval, it was suggested he would be a superior stallion to breed to warmblood and thoroughbred mares to pass on his movement, size and CLASS! His babies are all taking after him, especially in their magnificent size and gaits. Their free shoulders and lofty movement will make you the envy of all your friends. This striking 17 hand, white stallion is described by many as something from a romance novel. His picture perfect conformation and big as life personality make meeting him an unforgettable experience. Favory IV Delta, "Delta" was bred by Temple Farms in 1988. 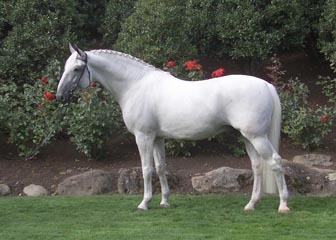 His historic bloodlines together with his beautiful conformation and movement earned him his approved licensing for breeding in 1998 by the Lipizzan Registry. Austrian Dr. Olallah is quoted as saying "it would be a crime not to breed this horse.We need to pass on his movement and elegant type. He would cross beautifully with warm- blood". Delta's first foal crop arrived when he reached the mature age of 13! His offspring have already proven themselves in the dressage arena winning many Championship ribbons. The temperament in his offspring has proven perfect for the adult amateur. Delta himself has shown successfully across the country at the FEI levels. He also earned multiple championships showing in-hand and collected numerous USDF, USEF, ODS, NWSBA, USLR awards, including Horse of the Year titles. 'Ariel' is a compact and powerful Lipizzan stallion, adhering to the best classical standards for breed type. He possesses three excellent gaits with much suspension. 'Ariel' is a full brother to the Devon national champion, Pluto II Dixana, and shares the same quiet temperament and desireable trainability as his older brother. His offspring inherit a free shoulder with a wide range of motion and a trot that makes it appear as though the horse is gliding smoothly over the ground. 'Barbarina', or 'Bobbie', is a veteran of the Spanish Riding School in Vienna and is trained through the famous 'airs above the ground'. All of his foals have been nothing short of spectacular. He passes on a long, beautifully arched neck and gorgeous, correct gaits. His offspring also inherit his majestic presence and ready willingness to work. This stallion is one of those 'once in a lifetime horses'. He produces some of the highest scoring offspring in the country. Beginning in 2008 we will be standing Maestoso Marina. This typey 3 year old is a fast learner and always eager to please his trainer. He enjoys strutting around for the other horses, spectators, our photographers camera, or even just for the sheer joy of it! He is sired by Spanish Riding School stallion Maestoso Platana 21 and out of the wonderful mare Marina, owned by Carole Gauger. This stunning colt has the wonderful personality, attention getting gaits and compact, athletic conformation that exemplify the classical Lipizzan. This stallion combines the best bloodlines found in North America coming from both Austria and Raflyn Farms.